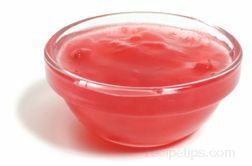 Microwaving is a quick and convenient method of cooking. 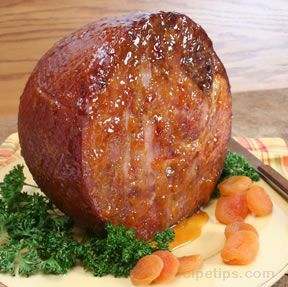 When cooked properly in the microwave, the results will be a juicy, flavorful ham. 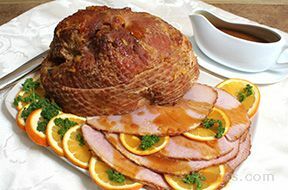 The hams flavor can be enhanced by the use of many herbs, spices and other flavorings. 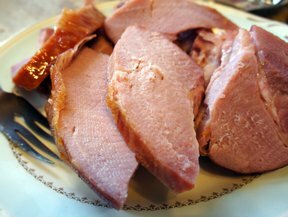 To enhance the flavor of the microwaved ham, use such flavorings as bay leaves, cloves, cinnamon sticks, sugar, and brown sugar. 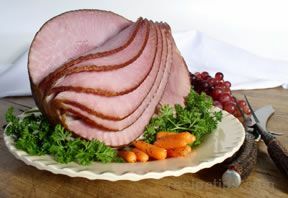 It can also be cooked with fruit, or in wine or fruit juices to infuse a unique flavor.When microwaving ham it is best to follow the manufacturer's instruction manual because different varieties of microwaves vary in cooking times, depending on their size and wattage. 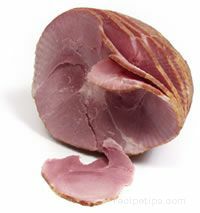 Half hams or portions will cook better in the microwave than a whole ham. 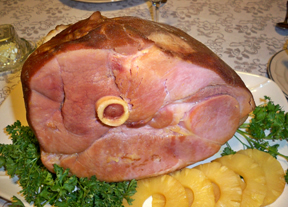 Ham should be microwaved at a medium to low setting to allow the heat to penetrate into the center of it so the ham is cooked properly without overcooking the outer layers. Note - Microwaving with Aluminum Foil: Before using foil in the microwave oven, refer to the user manual for that oven to see what is recommended. Some models are manufactured so that the magnetron tube is protected, which allows small amounts of metal, such as aluminum foil and metal skewers to be used. Do not use foil if the manufacturer does not recommend use. Care must be taken when using foil in the microwave. 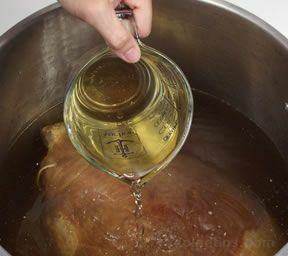 Use only thin strips or small pieces that are just large enough to cover the areas that need protection from overcooking. The foil pieces must be kept at 1 inch from the oven walls and 1 inch from each other. Cover just the outer cut edge with a thin strip of foil (see note above) to protect it from overcooking and place the ham, cut side up, into a cooking bag. Seal the bag and place in a microwave safe baking dish. Make slits on top of the cooking bag for steam to escape. 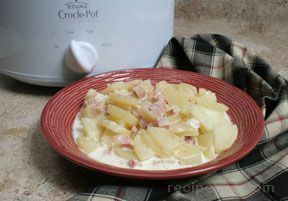 Place in the microwave on 50% power and cook for 12 to 15 minutes per pound. 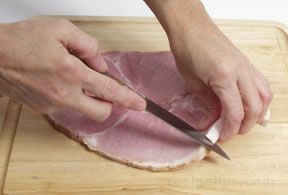 Rotate and turn the ham half way through the cooking time. 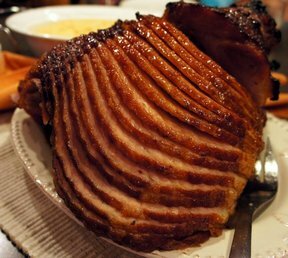 Remove the ham from the oven when its internal temperature reaches 155° F. Allow ham to rest for 15 minutes before carving. 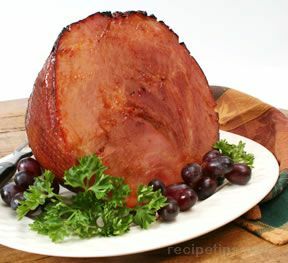 Ham should reach 160° F after resting. 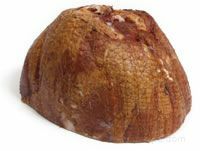 Cover just the outer cut edge with a thin strip of foil (see note above) to protect it from overcooking and place the ham in a microwave safe baking dish. Cover with vented plastic wrap and place in the microwave on 50% power. 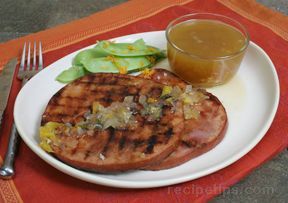 Cook for 10 to 12 minutes per pound. 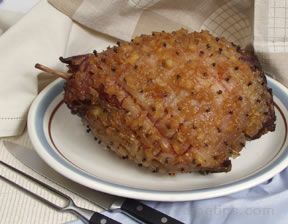 Rotate and turn the ham half way through the cooking time. 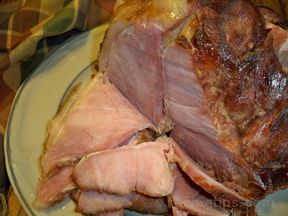 Remove the ham from the oven when its internal temperature reaches 135° F. Allow ham to rest for 15 minutes before carving. 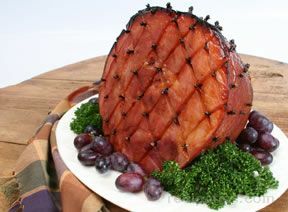 Ham should reach 140° F after resting. 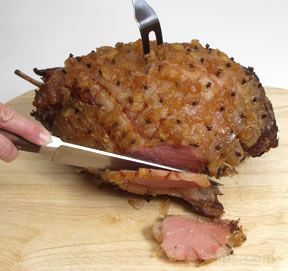 Cover just the outer cut edge with a thin strip of foil (see note above) to protect it from overcooking and place the ham in a microwave safe baking dish with 1/4 cup of water. Cover with vented plastic wrap and place in the microwave on 50% power. Cook for 10 to 12 minutes per pound. 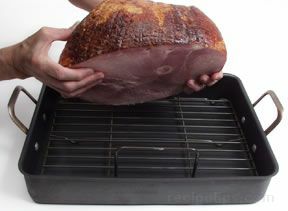 Rotate and turn the ham half way through the cooking time. 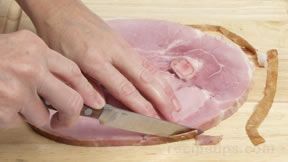 Remove the ham from the oven when its internal temperature reaches 135° F. Allow ham to rest for 15 minutes before carving. 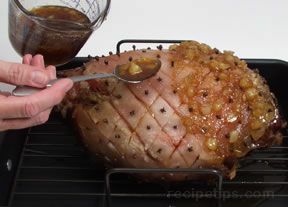 Ham should reach 140° F after resting. 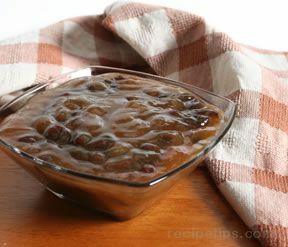 When microwaving, follow the times as stated in the recipe as close as possible and make proper adjustments according to any variance in microwave sizes. 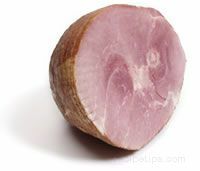 The ham should be cooked for the least amount of time suggested in a recipe because you can always cook it for additional time if not done but you want to be sure that it does not overcooked. 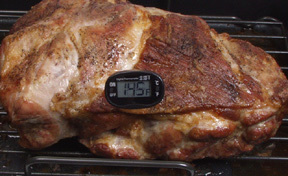 It is important to observe the standing times stated in the recipes before testing for doneness because the meat will continue to cook through conduction after it is taken out of the microwave. 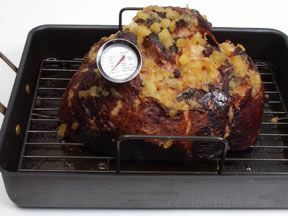 After the proper standing time test the ham for doneness in several locations with a meat thermometer to ensure that it has been cooked evenly throughout.